It’s strange how in some sports – think tennis, golf or skiing – it’s perfectly normal to have coaching – either when you’re starting out or on an ongoing basis. But in less established, more informal activities like BMXing, skateboarding and – yes – mountain biking, the vast majority of us just muddle along by ourselves. 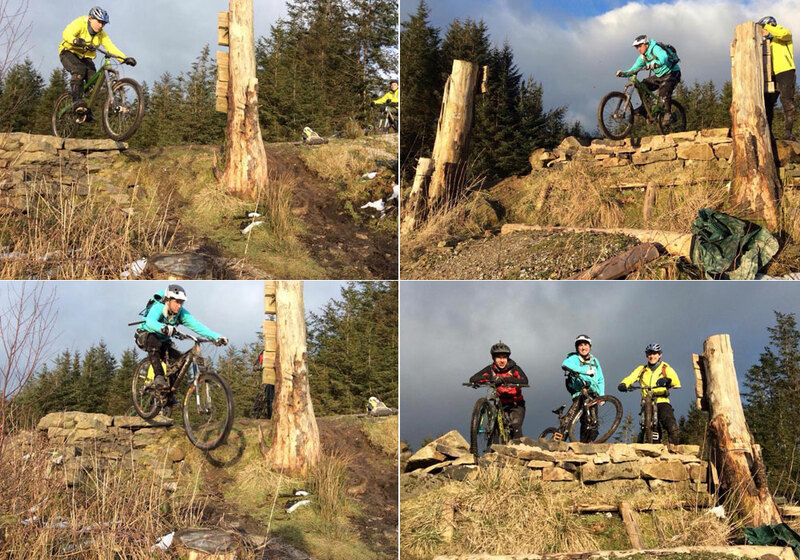 Yeah, some of us muck about with friends on jumps or drops from time to time – but its rare that we pay a professional to help us improve our skills. Prior to this session I’d had three or four skills sessions with other coaches – and had got something useful from each of them. To be honest I thought I’d learned as much as I could from a coach – and that the only thing holding my riding back now was my own head. I wasn’t planning on having any skills training, but my good mate Ade had heard good things about Pro Ride Guides and he wanted to book on a course at Gisburn. Considering he was traveling all the way up from Surrey for it, it seemed churlish of me to refuse his offer to join him on the “airtime” course – which was billed as “jumps and drops for intermediate and advanced riders”, or something like that. And I had to admit to myself that I had lost my bottle a bit when it came to getting my wheels off the ground – probably as a consequence of a broken arm and complications in 2013 that had kept me off the MTB for about six months. We left plenty of time to get to Gisburn on the day, but were so busy nattering in the van that we missed the turning and had to go all the way to Lancaster – then managed to pick about the worst route imaginable across the Trough of Bowland to get there. At least it was scenic though. Arriving slightly late and slightly flustered, we found our coach Joe Flanagan – the Hope-sponsored enduro racer – in the car park chatting with another rider (Chris I think). He took our tardiness in his stride and we all had a good chinwag as we pulled on pads, helmets and riding shoes ready for action. We were lucky in that there were only three of us booked on the course – whereas there are up to six spots available. 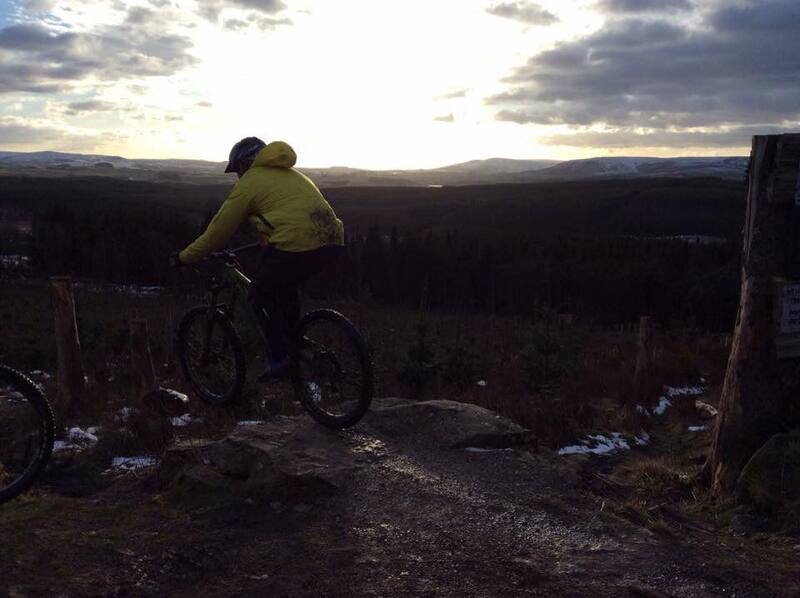 Joe started by getting us to ride a slightly technical bit of singletrack ahead of him to assess our abilities. He kept his conclusions on this to himself, but explained that we’d be starting out with some simple exercises to focus on body positioning while rolling steep sections. To be honest this felt comfortably within my existing skills, but it’s always good to warm up on the bike and get your eye in on something easy – and it was obvious Chris (we’ll stick with that name) was getting something out of it. Every skills course I’ve done has involved a frustrating and seemingly pointless drill where you’re asked to repeat a simple effort more times than you think is necessary. From experience, I suspected that today’s version of this – bunnyhopping over a stick – probably did have a useful purpose so I gave it my all. Repeatedly. While getting us to hop over the aforementioned stick, Joe was also honing our attack position (or whatever they called this, I’m sure you know what I mean though). PRG definitely have a more methodical approach than some coaching outfits. The aim is that by teaching riders the key building blocks of good technique, they’ll be able to apply them in a variety of real-life situations. While this might prove a bit dry in some hands, Joe’s lively and engaging personality meant that it didn’t feel as much like hard work as it should have. Next we took to Gisburn’s famous Hope Line to start working on jumps – and this was where things got more complicated than I’d expected. As I mentioned, I’ve had a bit of coaching before and was reasonably happy with my jumping technique – I just don’t tend to do it that much. However Joe explained that we were going to be getting a bit more advanced today, and introduced us to the concept of the scrub. You probably know what this involves already – and a lot of us do it instinctively when riding fast – but it basically sees the rider absorb a bit of the take-off lip and keep the bike low over the jump, pushing it back into the ground at the optimum moment. Watching Joe get his scrub on while whizzing through the small jumps at the bottom of the Hope Line was impressive and we were soon following suit as best we could – finding it much easier to take the closely-spaced jumps at speed by keeping our wheels in contact with the ground more. High elbows, light hands and heavy feet were also thrown into the mix as key pointers to help make sure we were in the right position. As well as the scrub we were introduced to the art of “popping” jumps – getting extra length from a short or slow take-off – and this is where the previous bunnyhop drill was intended to come into play. I wish I could say I was as successful at mastering this technique, but I was flagging a bit from all that hopping and struggled to get my big 29er wheels high enough to clear the Hope Line’s tabletops – which are tough to do at the best of times to be fair. After a much-needed lunch break and some cheese and pickle sarnies we made our way back up to Gisburn’s downhill lines, just along the fire road from the top of the Hope Line. It was time to move on to drops. First we focused on basic technique on a very small drop, taking it at different speeds and getting the feel for the required body position – then we turned to a larger drop off the fire road onto the left-hand DH track – only two to three feet in height but with the landing out of sight so requiring a bit of commitment. With this comfortably dealt with it was possible to continue down the run and hit a similar-sized drop which actually had an easier run in but was taken faster – and it felt good to string them together and keep the speed up. Ade had experienced brake issues in the morning and was borrowing my Patriot for the afternoon, which I’d cleverly stashed in the van in case of emergency – and this worked out well for both of us as I was able to pinch it back off him to hit the larger drop from the fire road onto the main DH run. I probably could have done it on my 29er, but I wasn’t really used to getting air on it at the time. It was about this time that Joe’s brother Sam Flanagan (also sponsored by Hope) showed up with some pals to say hi. Having two of the UK’s fastest enduro riders watching you practice drops is a good motivation to get it right. After a good few goes on that drop at a variety of speeds – nearly taking it too slow at one point – I turned my head 180 degrees to look at the thing I’d been studiously ignoring for the last hour or so. The “leap of faith” jump at the top of the Gisburn’s DH section has a steep, ski-jump like take-off and a six or seven foot gap – and to be honest I’d been in two minds over whether or not I’d want to hit it. After getting a demo from J-Flan, who insisted it was straightforward and even needed to be squashed a little bit, I decided to head up to the top of the run-in and see how I felt. After a sighting run and another two aborted attempts I noticed the light was fading and it was now or never. I finally committed and stayed off the brakes, not trying anything fancy and letting the trail dictate my speed. Giving the bike a pump on the lip, I took off and brought the nose down ready to land when – CLANG – I came up short and smashed rear wheel into the edge of the landing. Happily the 180mm of rear travel soaked it up and I stayed on the bike – to the surprise of my worried audience. With the dark encroaching and Joe no doubt imagining the difficulty of directing the paramedics in after sunset, there was no chance of another attempt sadly – and we hotfooted it back to the car park. Try to think of this photo as being atmospheric rather than just too dark. So how did the training translate back into my normal riding? Well I was happy to be back at the level of confidence I’d had for jumping and dropping before my accident and the difference jumping techniques provided interesting options and some skills to work on. Strangely the main benefit I found immediately – when we did a technical ride in Calderdale the day after – was nothing to do with getting air. It was the high elbows and light hands that stayed with me, providing an easy way to force my body into the correct position for the kind of rugged, rocky descents that I love riding. Ade’s friends who had recommended PRG had described their approach as being more race-focused than some other set-ups – and I’d fully agree with that. In fact Joe took the time to ask us all about our racing plans, if any, so he could put things into the right context. I’d also wholeheartedly recommend them. Yes I have been back to Gisburn since and no I haven’t done the leap of faith. I was all set for it but one of my brakes packed up and threw me off my stroke, honest. I can make you a solemn promise that it is going to happen soon though.